As many of you know, the untimely death of David Fish left a void in many of us. His creation, the list of Dividend Champions, Contenders and Challengers provided an indispensable amount of information for dividend growth investors. It is unclear who will inherit those responsibilities. This was the best list for dividend investors, with a comprehensive number of companies and a wealth of data for further analysis. But in the meantime, I came up with a nifty hack that could help each one to update the list quickly for themselves. I am not sure if I will be updating it on a monthly basis due to time commitments, but I can share with you how I will be updating the list for my use on a go forward basis. To start, I focused only on the list of dividend champions and the dividend contenders which have increased dividends for 24 years in a row. The latter are prime candidates for future inclusion in the dividend champions list. 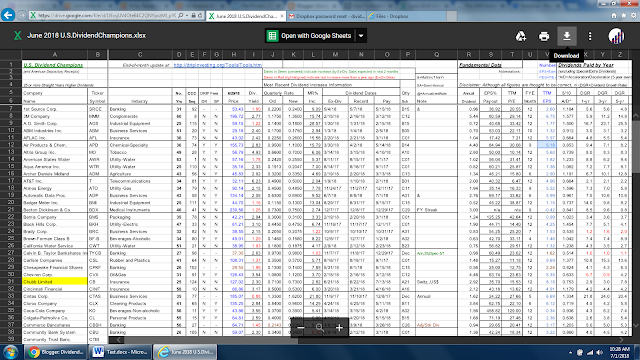 Second, I imported the list of dividend champions to create a custom portfolio in Yahoo Finance. 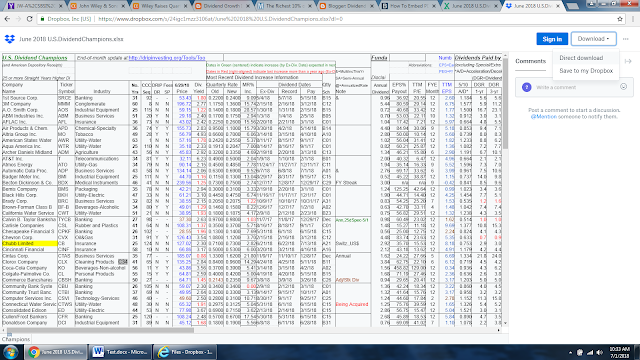 Third, I compared the dividend payment date from Yahoo to the data left from David Fish. For any increases, I updated the streak of dividend increases upwards. For any decreases – I dropped the stock from the list (there were none). I also reviewed the companies that seemed like they haven’t raised dividends for over a year. Those would likely be dropped from the list by the end of 2018. There were two new additions to the Dividend Champions list. The first is Chubb (CB) and the second John Wiley (JW.A). Fourth, I updated the trailing EPS number and deleted the columns I never use, such as Graham number and technical numbers. These are columns that I don’t use – perhaps you use them so in your process you should keep or expand upon them. I also updated the last price for June, which automatically updates the trailing P/E ratio, EPS Payout and the Dividend Yield. Last, this process took a lot of time, because I did a few verifications that went beyond the process. As you know, I look at notable dividend increases on my site every week or so. The automatic process had failed to account for the increases in companies like H&P (HP) for example. I spent quite a lot of time verifying whether I am looking at genuine dividend increases, or just having bad data. Reviewing dividend history on Seeking Alpha was super helpful. It is one of my favorite dividend resources. I have even more respect for the amount of work that Dave Fish did for all of us over the past decade by updating this list painstakingly. And never complaining about it either. You can view the updated list of Dividend Champions as of June 29, 2018 by following this link. You can download the file into spreadsheet format. Please share this post with your friends, so that they know about this update!